SWEDEN scored a great success finishing ahead of 60 countries from all over the globe which took part in the open series of the 14th World Bridge Games, held in Lille, France, 9th – 23rd August 2012. Sweden qualified third in their group, but went ahead to beat Israel, USA and Monaco in the knockout; then they faced Poland in the final, whom they beat convincingly. Thus, Sweden became the sixth country ever to win the prestigious Vanderbilt Trophy, awarded to the winner of the competition (formerly World Team Olympiad) which was initiated in 1960 and is held every leap year. Other winners in the history of the event have been Italy (5 times), France (4 times) and Brazil, Poland and USA (once each). In the playoff, Monaco beat Ireland for the bronze medal. In the women’s series, ENGLAND defended successfully their title won in Beijing ’08 and added one more gold medal in their list of achievements. They beat Russia in the final, while the bronze medal went to Poland who prevailed over France in the playoff. Finally, in the seniors, HUNGARY scored a sensational victory, clearly beating USA in the final, while France got the bronze medal, outscoring Sweden in the playoff. This is the first (gold) medal for Hungary in a world bridge competition ever! The World Bridge Games also included the 5th World Transnational Mixed Teams com­pe­ti­tion which was contested by 83 teams. 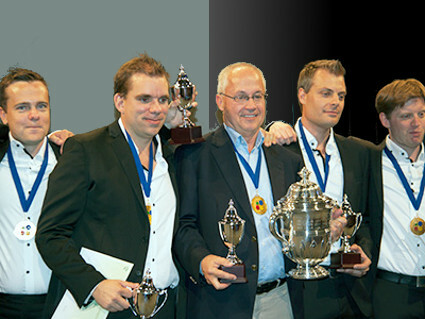 The winner was team MILNER (Italy, Netherlands, USA). They were followed by CANADA and China’s SAIC RED. 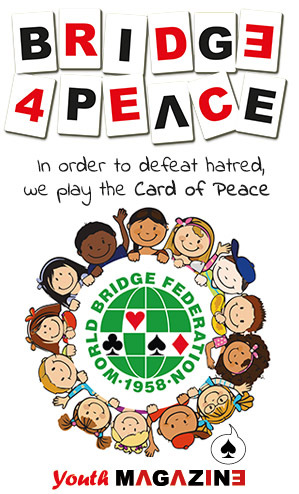 The 14th World Bridge Games were part of the second edition of the World Mind Sports Games, organized by the International Mind Sports Association (IMSA). Besides bridge, chess, droughts, go and xianqi (Chinese chess) were included in the Games, which took place in Lille’s Grand Palais convention center.